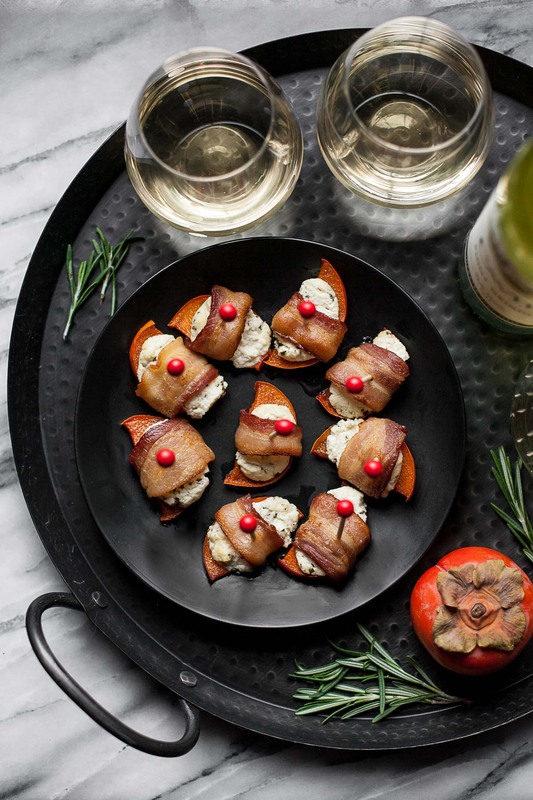 These persimmon bacon bites with rosemary goat cheese are the perfect festive appetizer and only require four ingredients! This post is sponsored by Cavit in partnership with Honest Cooking. If you’re looking for a craveworthy appetizer to keep your family happy while you finish cooking Christmas dinner or to pass around at a New Year’s Eve party, I have totally got you covered. These persimmon bacon bites are the best app I’ve eaten in recent memory, and are super cute to boot. 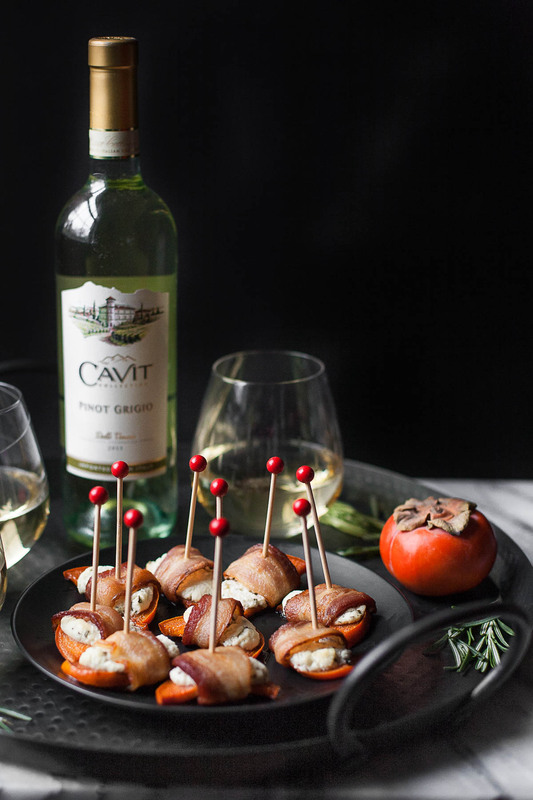 They pair perfectly with a chilled glass of Cavit’s crisp Pinot Grigio, and the combination is pretty much guaranteed to put even the grinchiest of grinches in the holiday spirit. When you’re snacking on fruit with bacon and herbed goat cheese and sipping on tasty Italian wine, there’s just no way not to feel festive. I just discovered persimmons this year and they’ve quickly become my new favorite fruit. They taste kind of like a delicious mashup between a mango and a papaya, and I find them incredibly addictive. I used fuyu persimmons here and haven’t had a chance to try other varieties yet, so I recommend finding fuyus for this recipe. They’re the ones that are kind of squat like little pumpkins and are not pointed at the bottom. When I’m eating a persimmon plain, I like to let it get nice and soft so the insides are custardy and smooth. However, when you’re making persimmon bacon bites, you want to choose persimmons that are still a bit firm so the slices will hold together well. Once roasted, they’ll have that smooth texture of a perfectly ripe raw persimmon with an even deeper sweet flavor. The hint of rosemary in the goat cheese makes these bites taste fresh and seasonal, and the bacon ties everything together both literally and figuratively. and a touch of turmeric–a comforting paleo dinner for fall. There was a touch of fall in the air this weekend, especially in the early mornings. So, even though the highs will be in the 80s all next week, I’ve decided it’s time for fall comfort food. 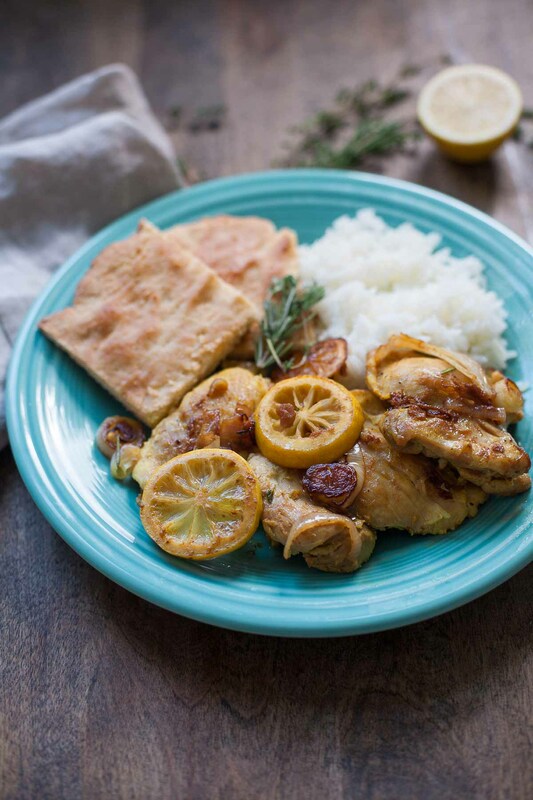 And this Lebanese lemon chicken fits the bill exactly. 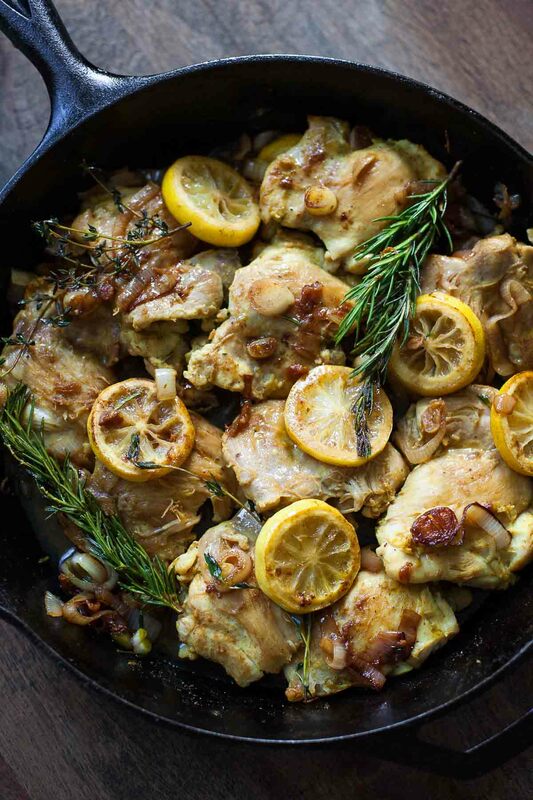 The flavors of lemon, rosemary and thyme hint at cooler weather, but the dish is fast enough not to heat up your entire house if the temperatures outside are still hot. This recipe is inspired by the Lebanese chicken dish I had for lunch from the hot bar at Whole Foods last week. I don’t do well if I grocery shop hungry, so when I arrive at the store not totally full, I get something to eat from the prepared foods section and sit down and eat it before doing my shopping. Whole Foods’ version of this dish was made with bone-in, skin-on chicken, and also had potatoes, olives, and a few other ingredients. I loved the overall taste of the recipe, but wanted to simplify it a little.